"Herb dinner rolls: these go with everything!" In a small saucepan, heat sour cream until very hot. Add salt, sugar, and melted butter. Cool until lukewarm. In a large bowl, dissolve yeast in warm water. Mix in sour cream mixture, eggs, flour, and chives. Cover, and refrigerate overnight. Preheat oven to 375 degrees F (190 degrees C). Grease baking sheets or line them with parchment paper. Divide dough into 4 parts; shape each piece into a ball. Cover dough rounds with plastic wrap when not working with them. Roll a ball into a 10-inch circle. Let dough rest while you roll out another circle. Cut first circle into 12 thin pie-shaped pieces. Starting at the wide end, roll up each triangle, ending with the point. Curl the edges in toward the point. Place point-side down on prepared baking sheets. Repeat with remaining dough. 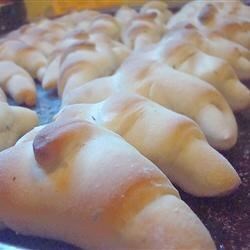 Allow crescent rolls to rise until doubled in size, about 30 minutes. Bake in preheated oven until golden brown, 12 to 15 minutes. Made these last week and even the residential "picky" eater loved them! I was impressed with that. Thanks for sharing. Came out hard as a rock. What a wonderful recipe! Turned out fluffy and delicious! These were sooo yummy. Light and flavorful! My whole family loved them. They are our new every holiday rolls. Made these for Thanksgiving and they were a hit with my kids as well as with my father who I classify as "picky."